(4 p.m. EDT) -- A new agreement between Disney Cruise Line and PortMiami outlines plans for a dedicated cruise terminal that will accommodate ships with more than 3,500 passengers. A memorandum of understanding (MOU) was put forth on September 5, 2018 before the Miami-Dade Board of County Commissioners. The document details that Disney Cruise Line would have first rights to negotiate a new terminal on the south side of the port. Before the terminal is approved, the port must complete a widening of the ship channel and turning basin on the south side, along with the acquisition of rights to the land currently leased to Seaboard Marine for cargo use. If plans for a new south side terminal (to the east of Terminal J) fall through, alternative berthing options on the north side of PortMiami could be considered. The first large Disney ship is expected to arrive in January 2023, with four- and five-day sailings. Another ship carrying 3,500 or more passengers would sail three- and four-day cruises by January 2024. Disney Dream and Disney Fantasy are the two current ships in the fleet that can carry up to 4,000 passengers apiece. Disney Cruise Line's forthcoming new-builds -- expected to launch in 2021, 2022 and 2023 -- will be a similar size. 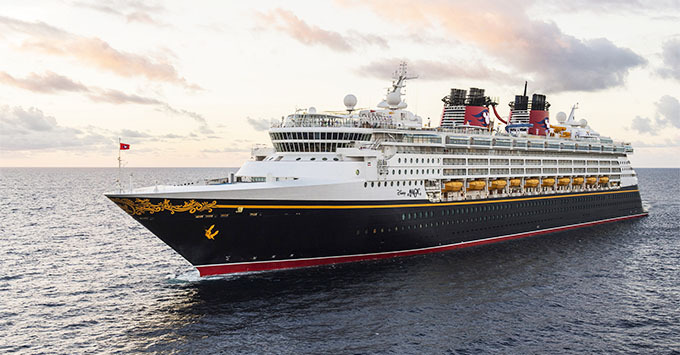 Disney Magic offers regular sailings out of Miami. "Disney Cruise Line has been a valued cruise partner at PortMiami since November 2012," said Miami-Dade County Mayor Carlos A. Gimenez in a statement. "With new vessels on order through 2023, we are collaborating with the Disney team on a memorandum of understanding for the potential development of a new cruise terminal project. "The new facility will allow the port to expand its cruise business by accommodating Disney vessels capable of carrying more than 3,500 passengers. Investing in PortMiami's infrastructure positions Miami as a global destination for visitors. We couldn't be more excited to work with Disney on expanding growth opportunities in Miami-Dade County." Also mentioned in the agreement is the potential for preferential berthing rights for Disney at Terminal J on Sundays, and at Terminal C on Saturdays beginning in 2020. Disney currently has preferential Sunday berthing rights at Terminal F through 2019. The deal is a lucrative one for both the cruise line and the port. Dockage revenue provided to PortMiami would increase by $890,000 in 2019. According to the document, the agreement is expected to generate $2.7 million in gross revenues and 360,000 Disney passengers through Miami by 2023. Currently, Disney only guarantees 100,000 passengers annually through the port. Also in the news, some or all of Disney's new cruise ships will homeport -- at some point -- at Port Canaveral's new Terminal 3 in Orlando.